Renovating My Lawn: ready, set–wait. Having spent most of the past six months researching and writing about this topic (and yesterday writing about one aspect of it), I’m gearing up to put all my new theoretical knowledge into practice. One thing is sure: if it works on my lawn, it’ll work anywhere. Indeed, if you saw my lawn, you’d probably look elsewhere for advice on caring for yours. 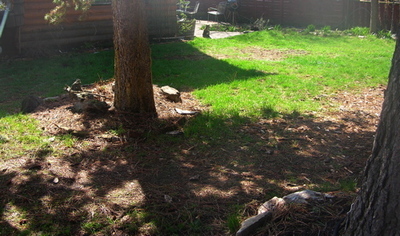 In my defense, let me say that neither lawn nor garden (nor house, for that matter) had received any care from the previous owner, one of Bozeman’s many avid outdoor folk who used the house to sleep in, but who for all intents and purposes lived outside–not in his back yard, but in the mountains nearby. So for the twenty odd years of his tenure, the grass that was here got mown, but that was about it. And truth to tell, it hasn’t gotten much more from us in the seven years we’ve lived here. I did undertake one major task, digging the creeping bell-flower roots out of one section of lawn, but that is definitely a post unto itself. This spring, I’ve been weeding sporadically, trying to get things cleaned up enough to start the sequence laid out so neatly in the article I’ve been working on: weed, aerate, amend, overseed. (If my amendments are good enough, I may not fertilize till fall.) I’ve never aerated, and I’m dying to see what transformative effects it will have. I’ve gotten a seed mix from a local greenhouse, their low-water use mixture of native fescues, which should do well in our largely shady yard. This is the year—this is when it will happen—this is it, I’m sure. 3 Responses to Renovating My Lawn: ready, set–wait. Aeration is definitely the way forward for lawns, Kate. We know a thing or two about lawns in the UK, and if you can’t invest the couple of centuries of regular mowing that produces a really excellent, Hampton Court-style lawn, then annual aerating and scarifying is the next best thing. Plus a dressing of lawn sand in the fall… if you’re not utterly exhausted by then. I can’t believe someone’s seen this already–I just put it up! Ah, but it’s actually morning where you are, not the middle of the night. Yes, you certainly do know about lawns in the UK–it was fascinating, learning a bit about the history of lawns, so much better suited to the lands where they’re “native” than to the less temperate, drier extremes of North America. “Scarifying” is a new term to me–as is “lawn sand.” I’ll have to look these up. Thanks for stopping by, and commenting. I think you have a good plan with the fescue and I am reluctant to offer any advice as you are already so knowledgeable about the topic. I will add that we have seen good success with a fescue seed blend that also has Crested and Streambank wheatgrass. It’s for a more low-maintenance lawn. We have quite a few guides and posts about fescues so hopefully this might help: http://www.naturesfinestseed.com/Fescue-Grass-Seeds/Guides/How-to-Fertilize-New-Fescue-Grass-Seed-Lawn.